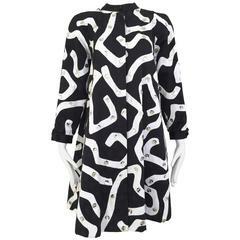 Geoffrey Beene, whimsical, black and white jacket having a " shaggy" edging along the cuffs, hem, necklne and center front. 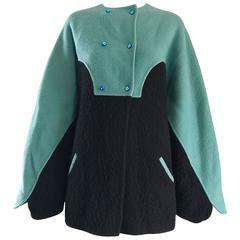 Jacket has a black chiffon backing with white raised dots ( fils coupé ). Very graphic. 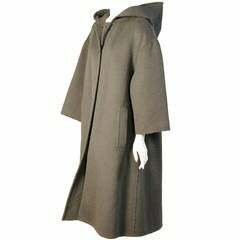 Geoffrey Beene, wool knit and mohair ribbed, grey kimono style, swing coat having a grey and black striped interior and black large ric rac trim. 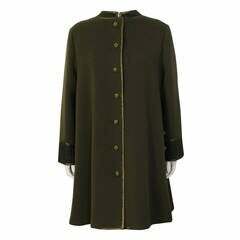 Geoffrey Beene, cotton, patterned, belted kimono having deep patch side pockets and a purple satin lining. Geoffrey Beene, simple, narrow cut, double breasted, brown, brushed wool coat, having a " funnel " collar and small red button closures. 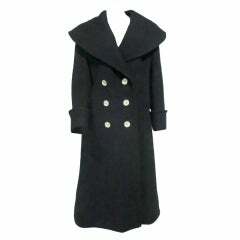 Geoffrey Beene 80s black double breasted wool coat with portrait collar and rhinestone buttons. Cuffed sleeves. Size 8 approx. Originally sold at Saks Fifth Ave.